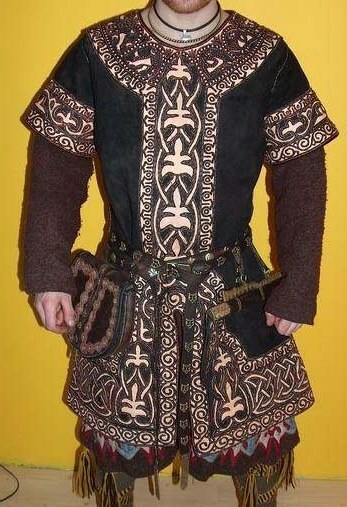 2.1 Viking-style medieval leather armour. 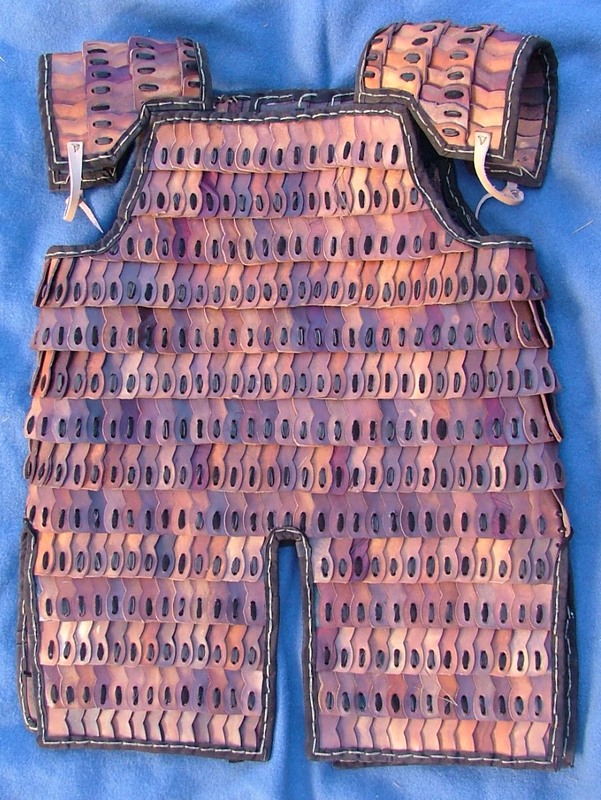 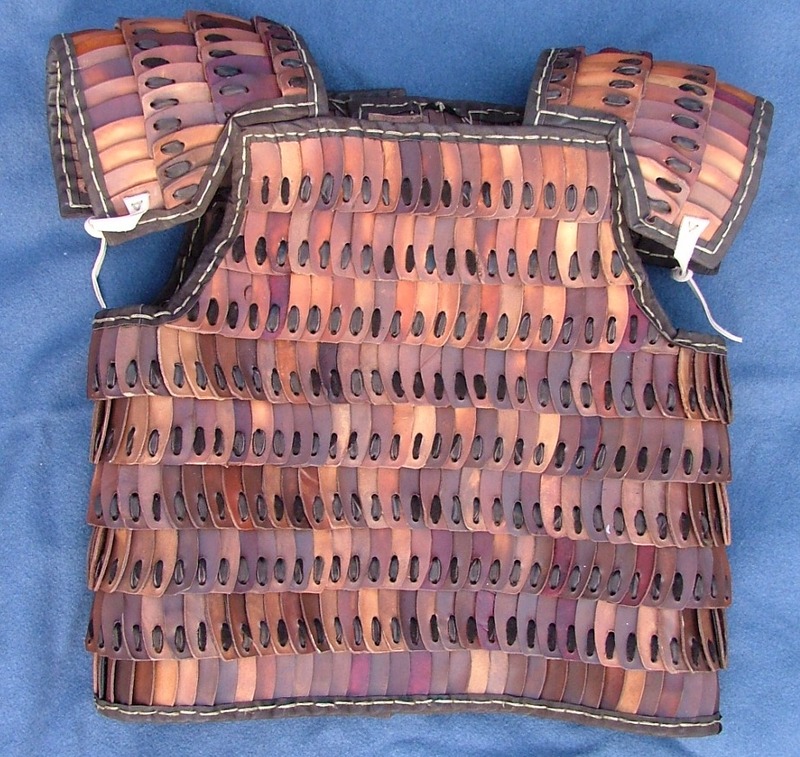 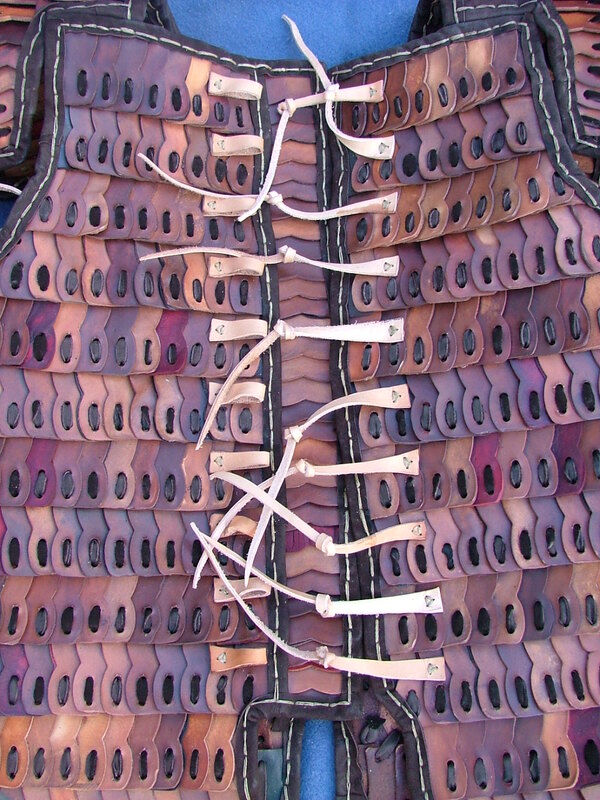 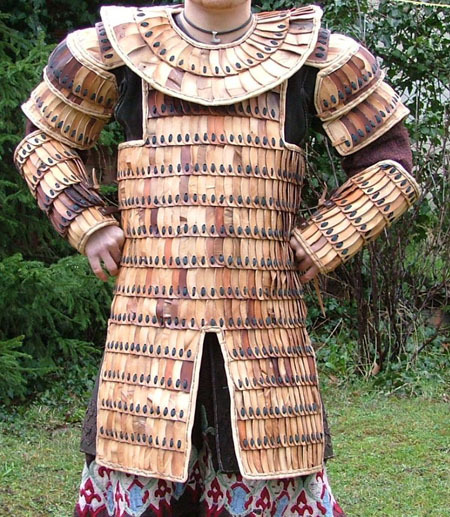 2.3 Lamellar body armour made of D-shaped plates. 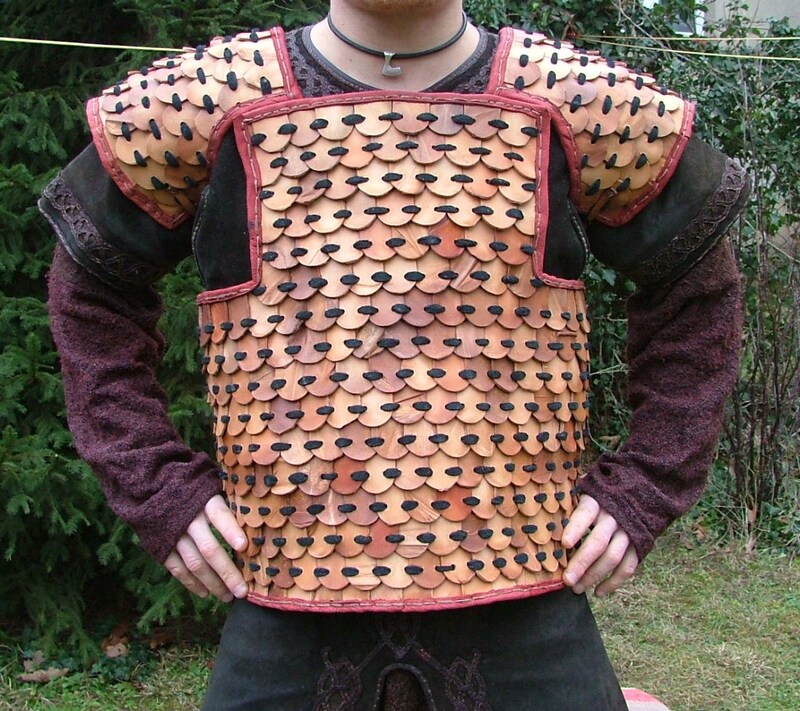 2.4 Cuirass with Longobard-style ornaments. 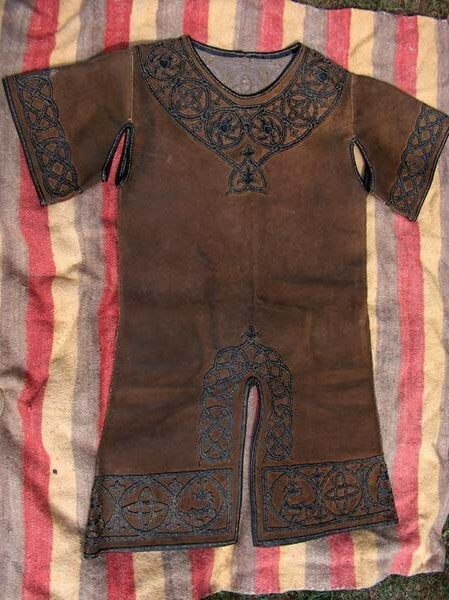 2.5 Armour with Viking-style ornaments. 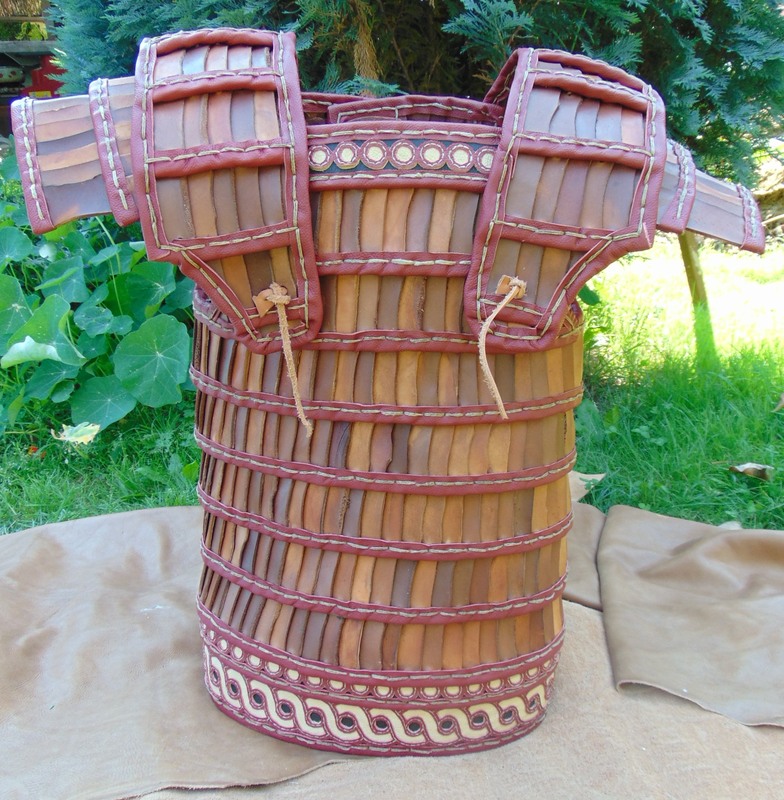 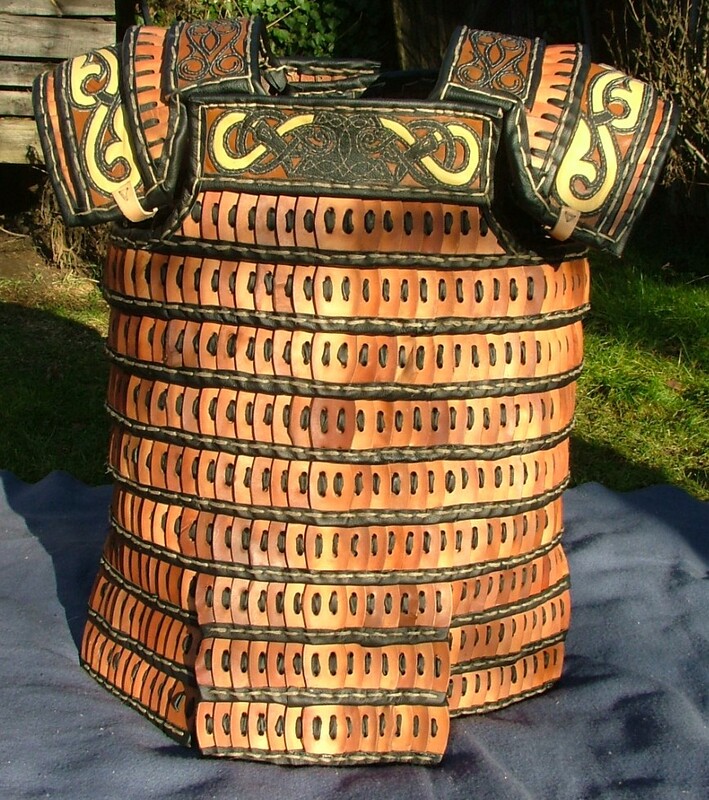 2.6 Leather lamellar armour with floral ornaments. 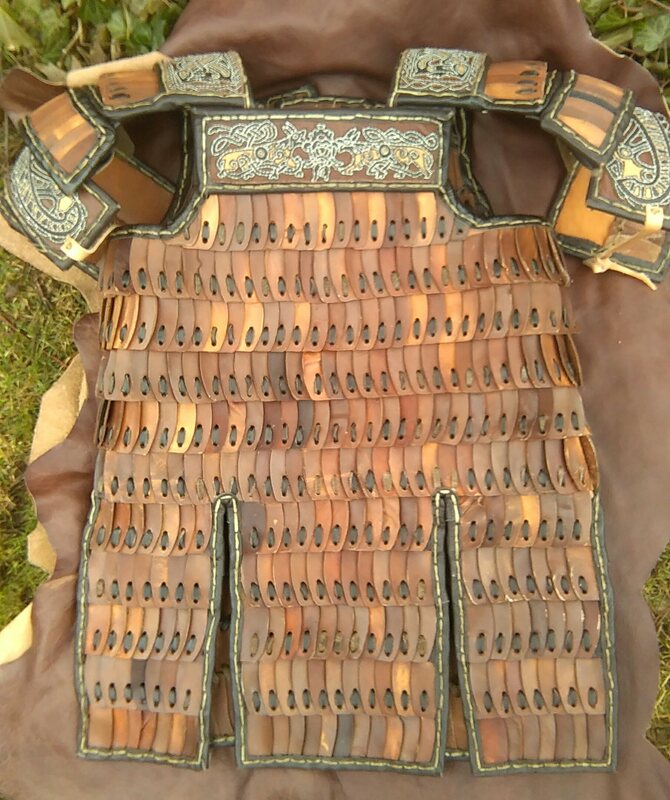 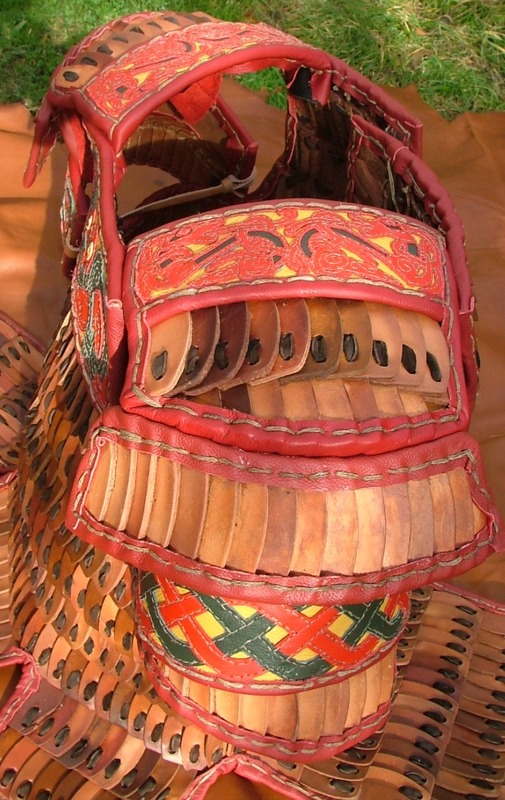 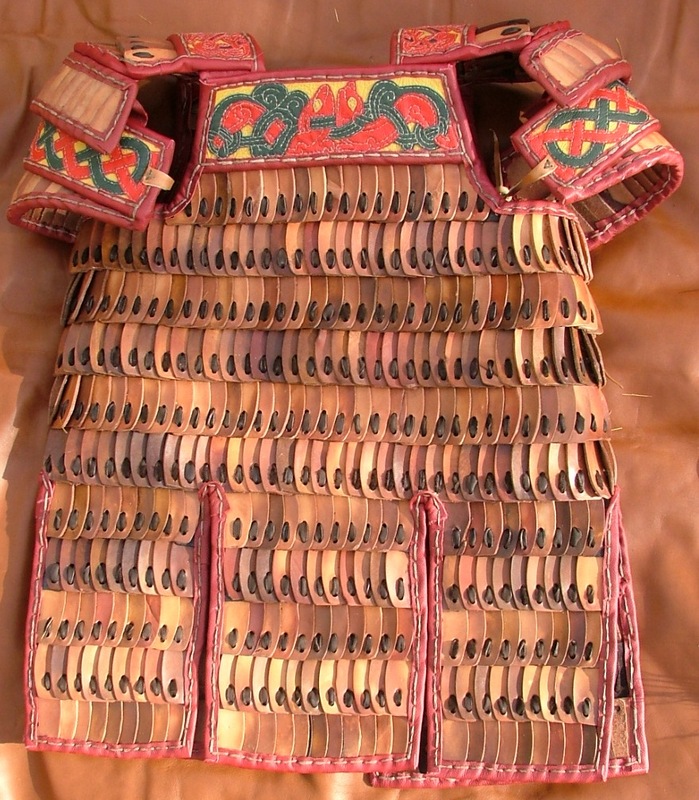 2.7 Richly decorated leather lamellar armour. 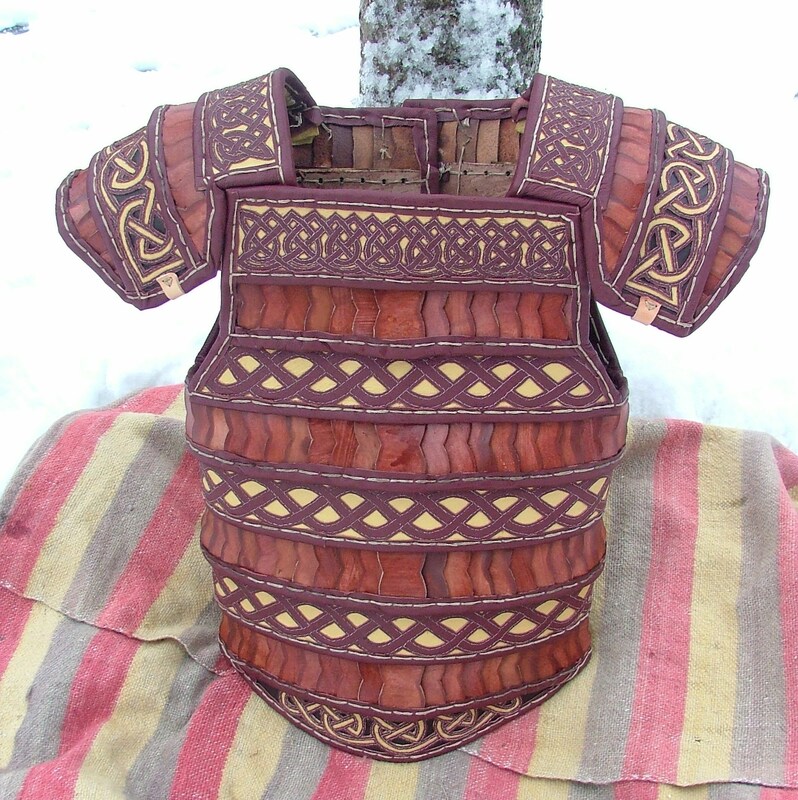 2.8 Lamellar cuirass with Celtic-style ornaments. 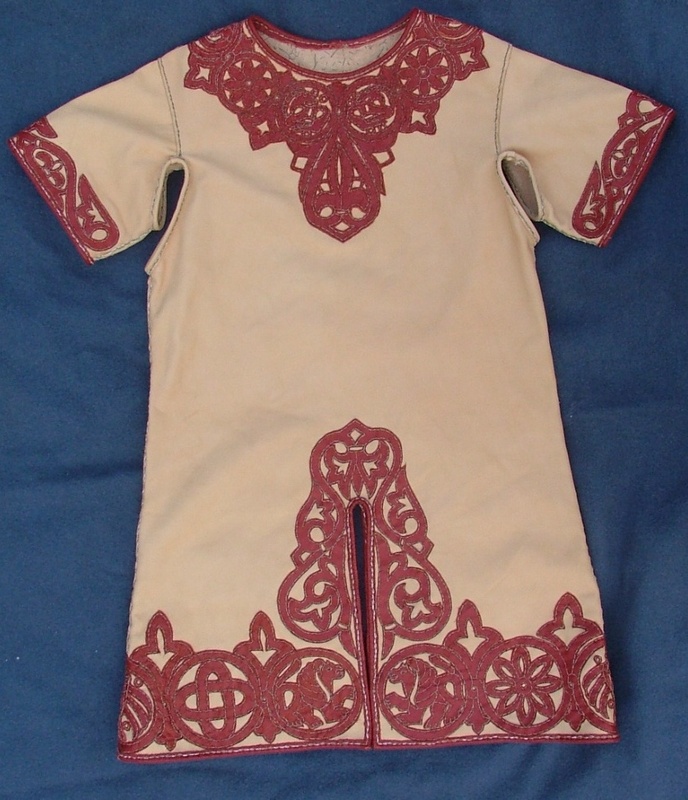 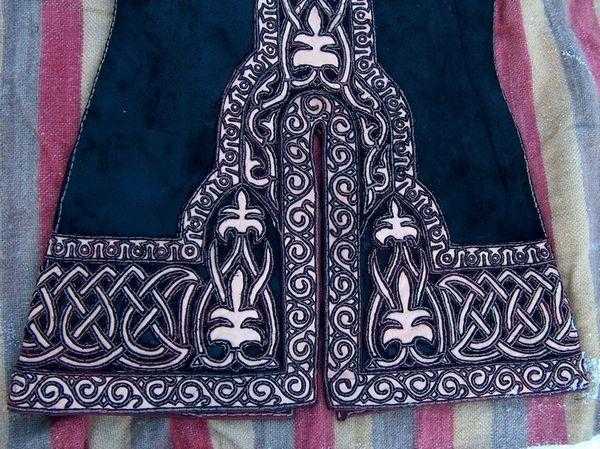 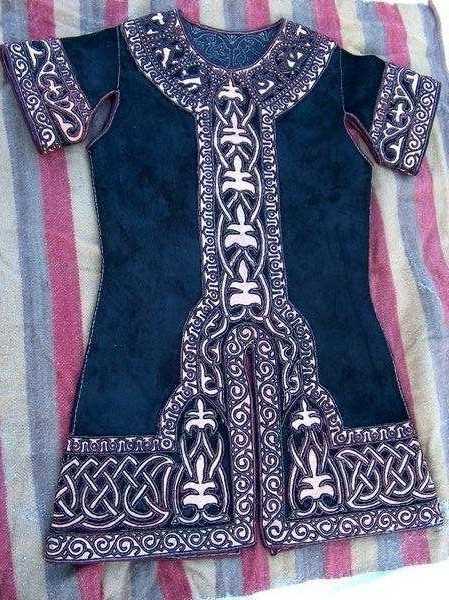 2.9 Leather caftan richly appliqued. 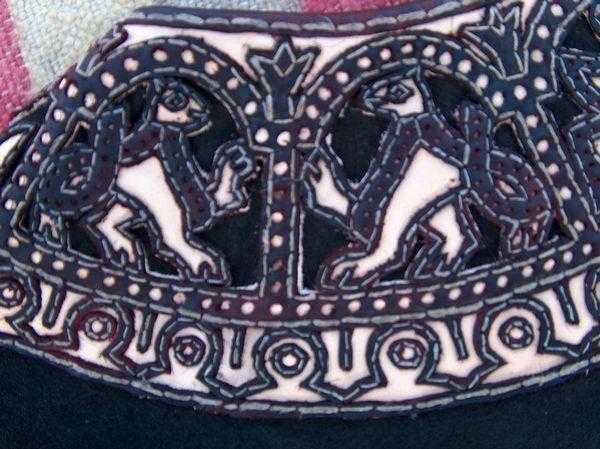 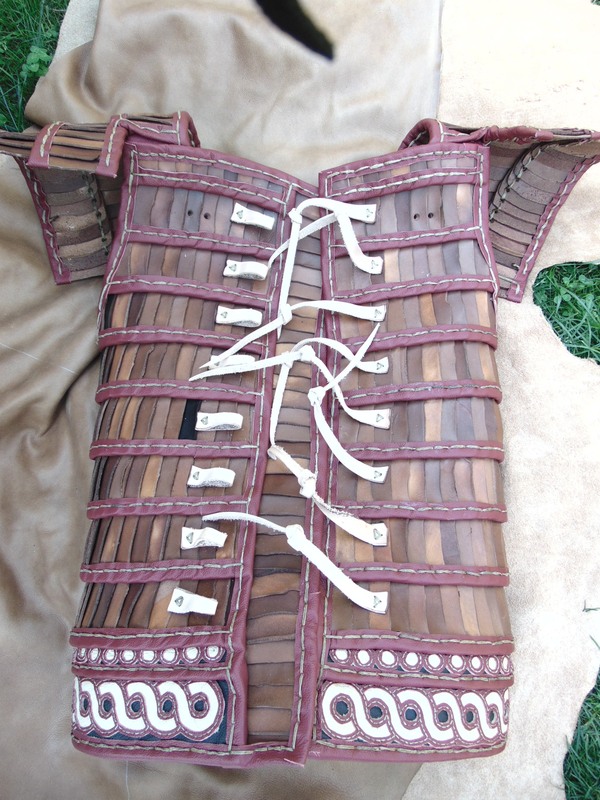 2.10 Lamellar leather armour with appliques. 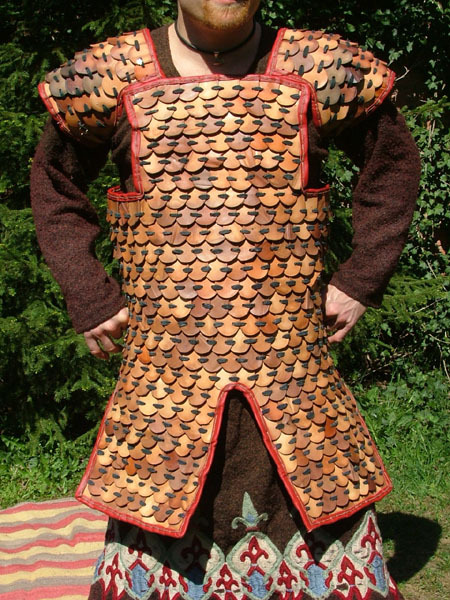 2.13 Byzantine leather lamellar armour. 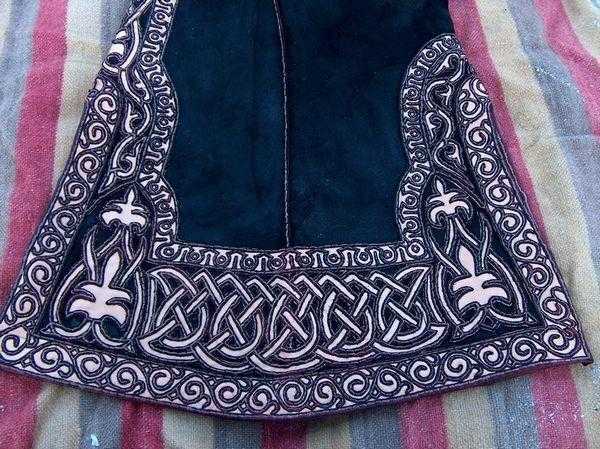 Decorated with appliques. 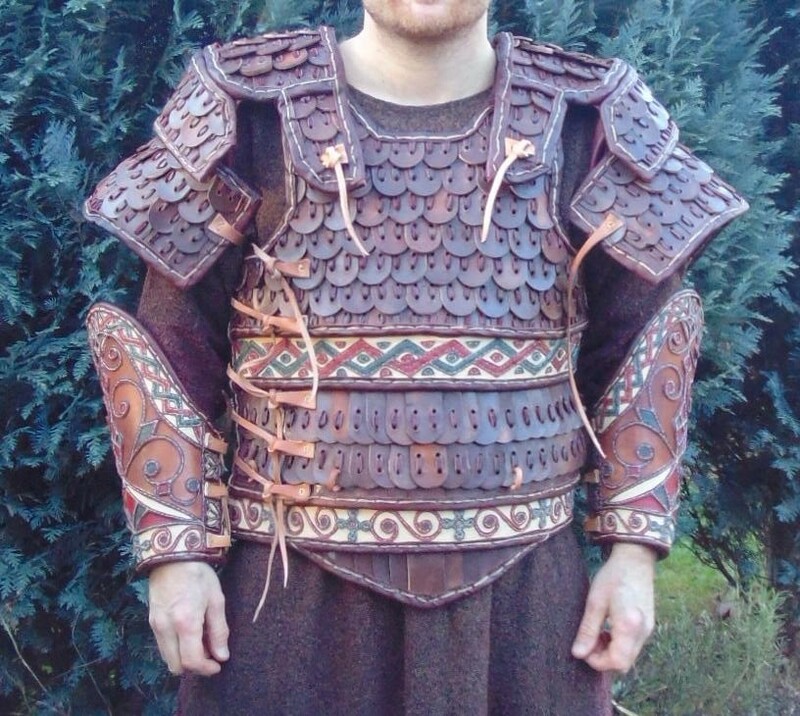 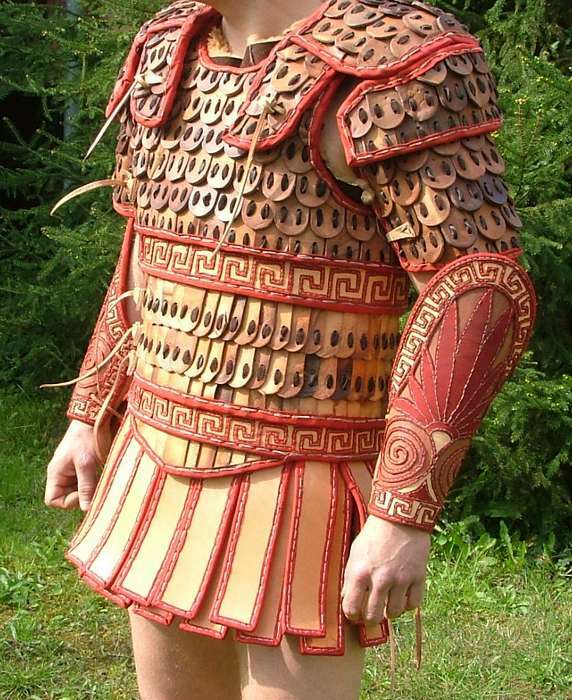 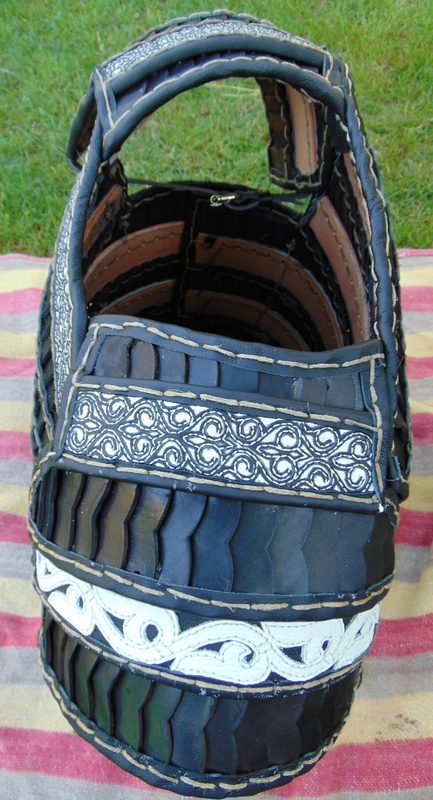 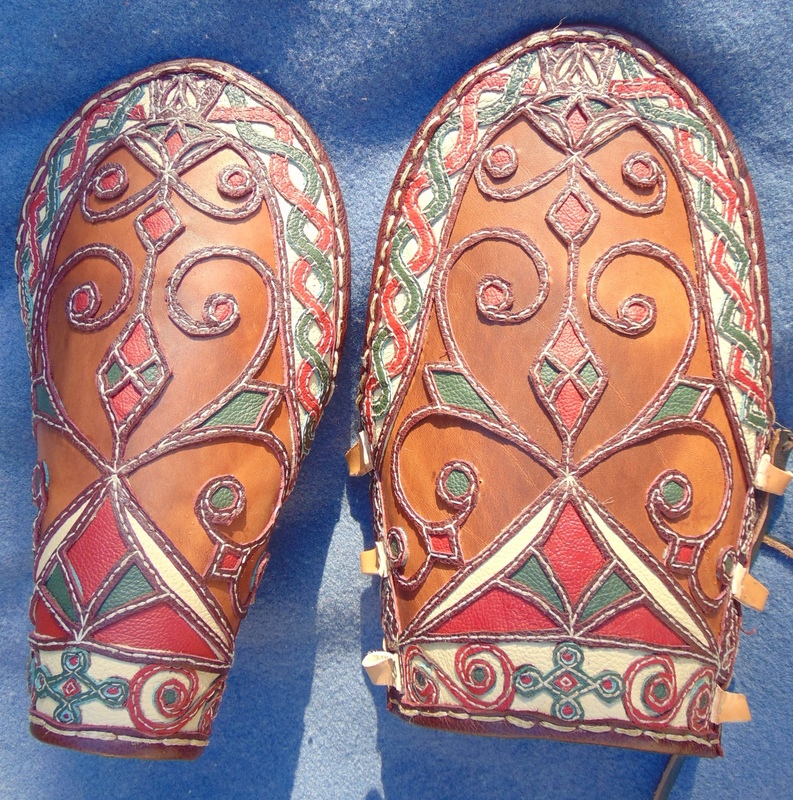 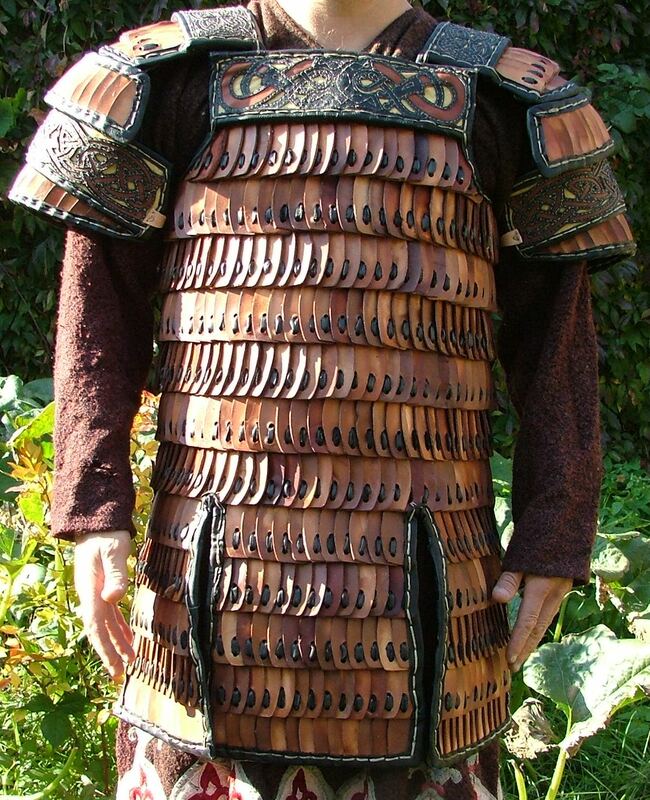 2.14 Lamellar leather armour with Gothlandic-style ornaments from the V/VI century. 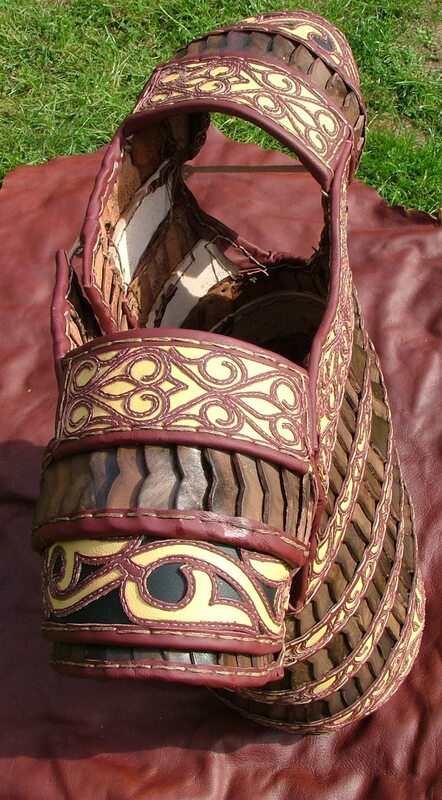 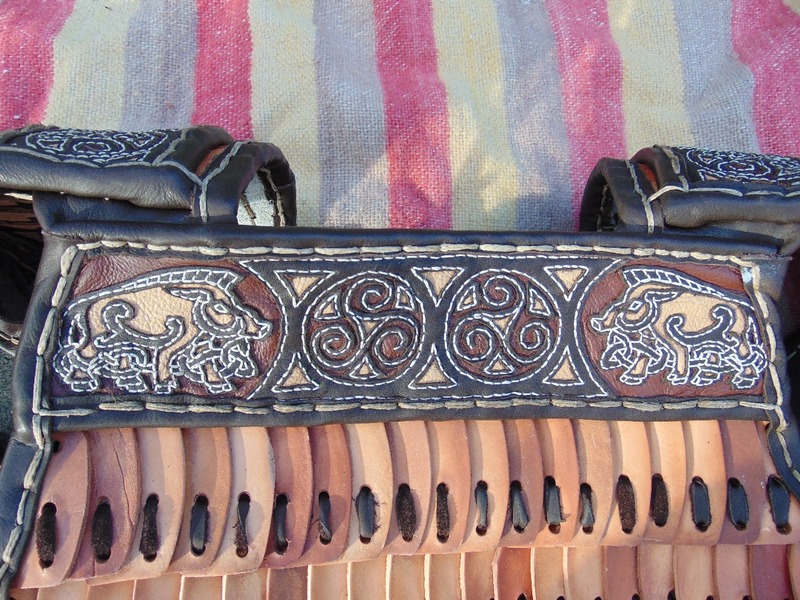 2.15 Leather lamellar armour with Germanic ornaments. 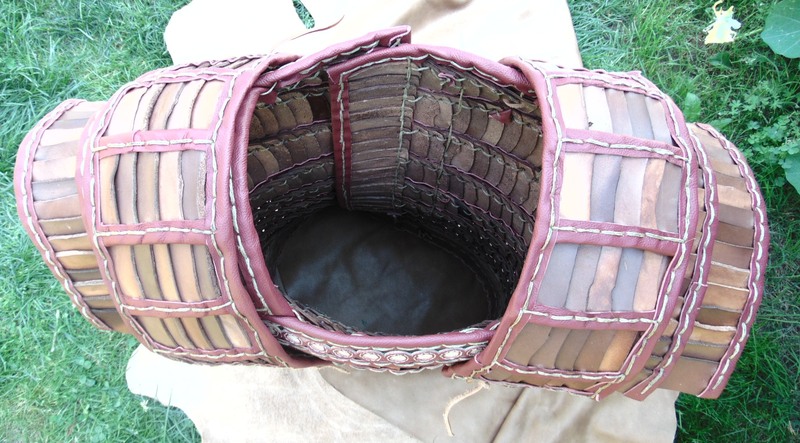 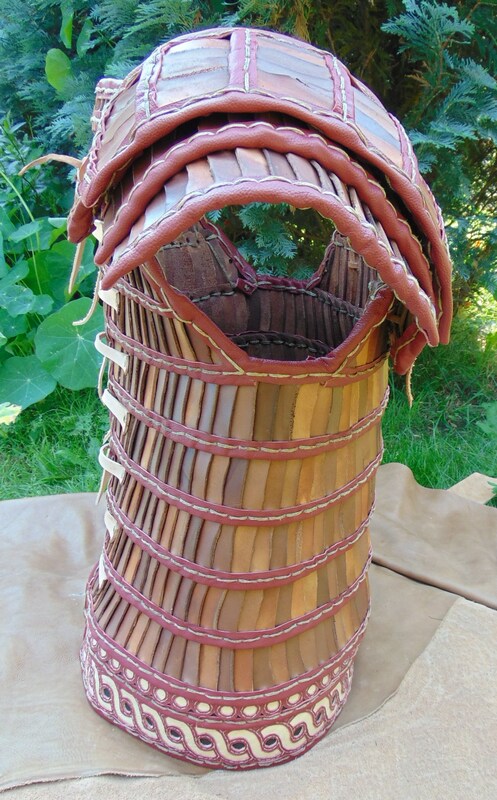 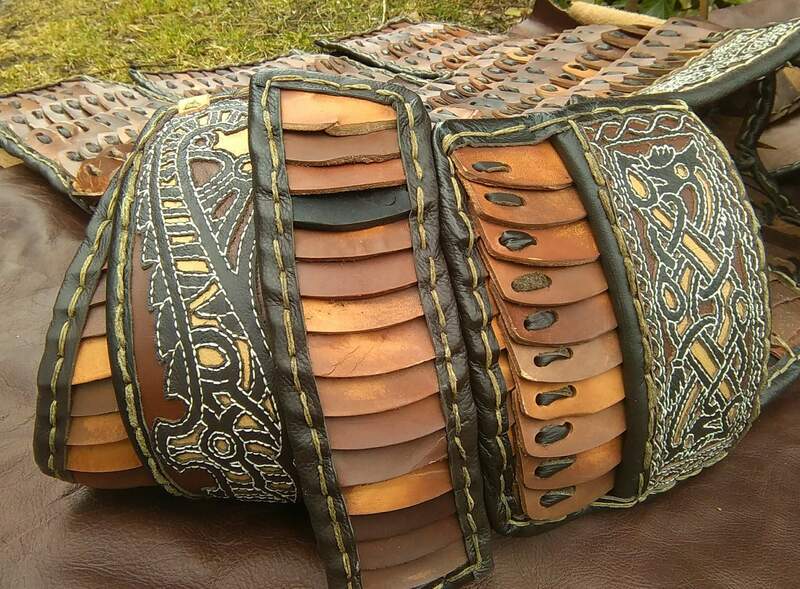 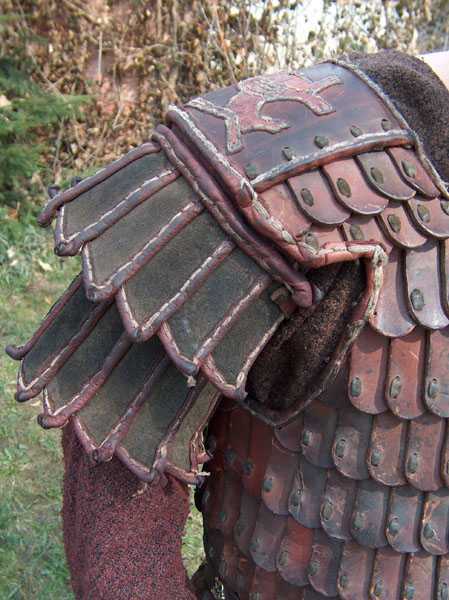 2.16 Leather lamellar armour with gorget, upper and lower arm protections. 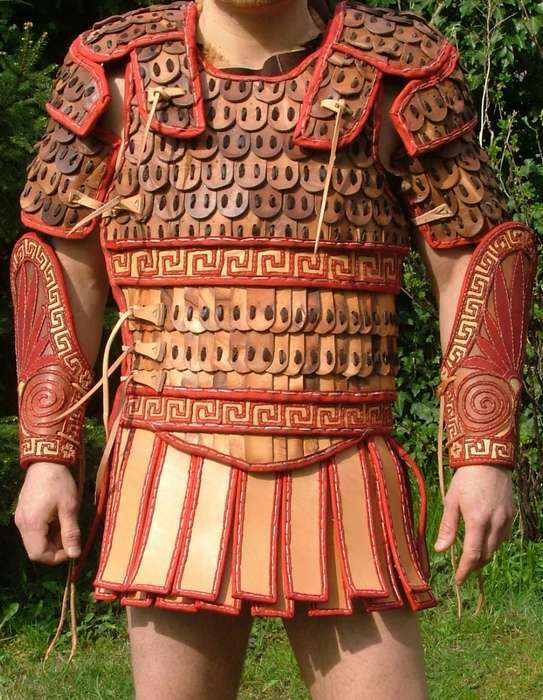 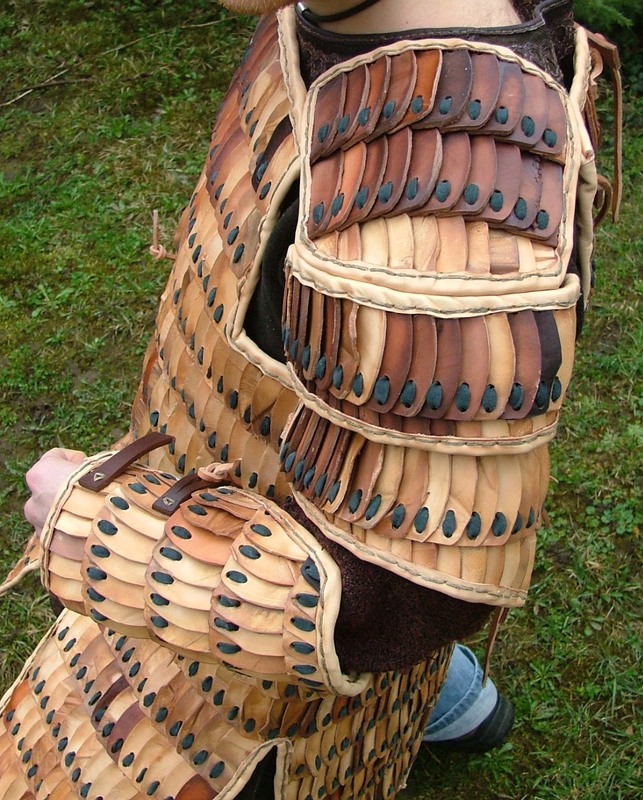 2.17 Hoplite leather lamellar armour. 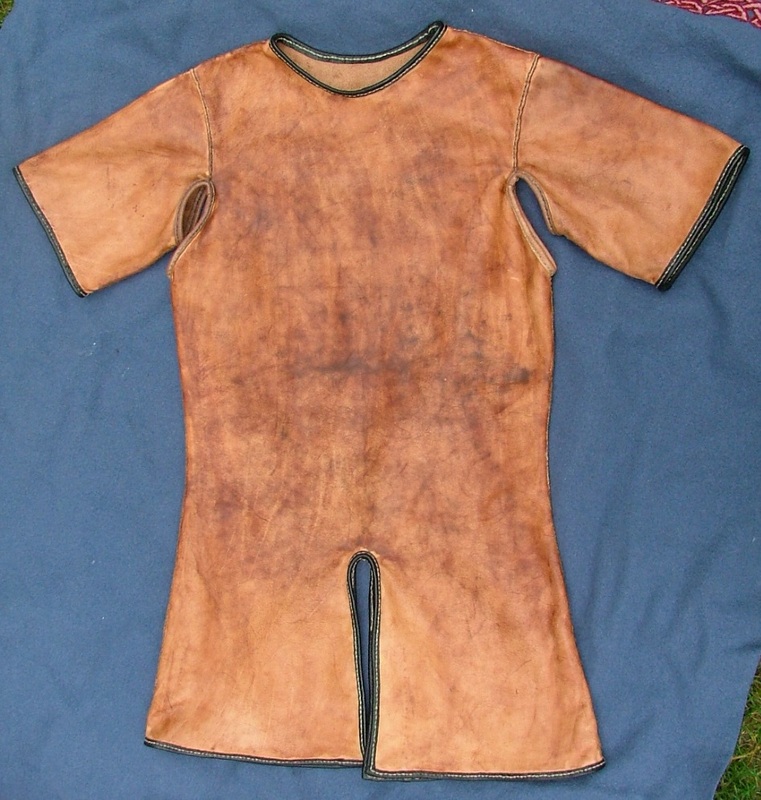 2.18 Bysantine medieval leather armour. 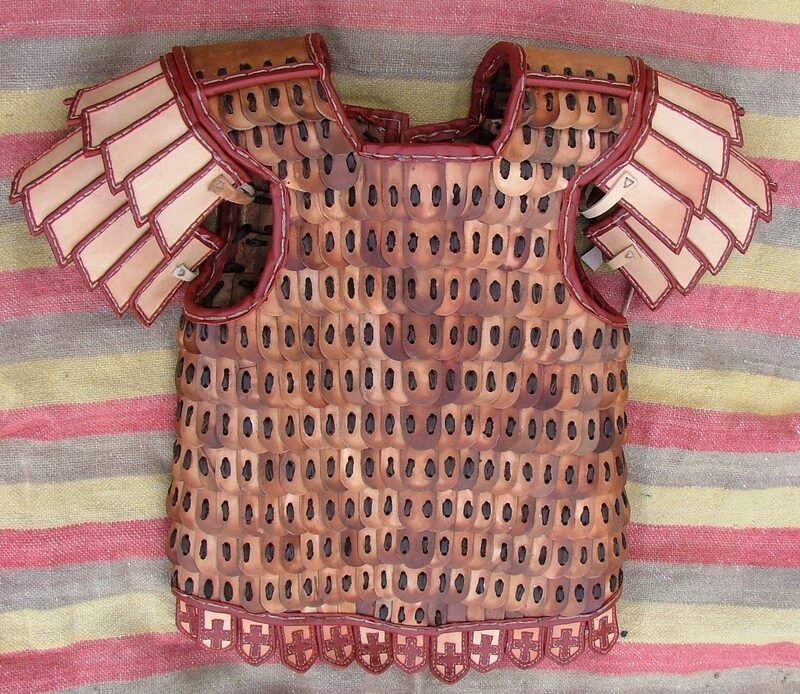 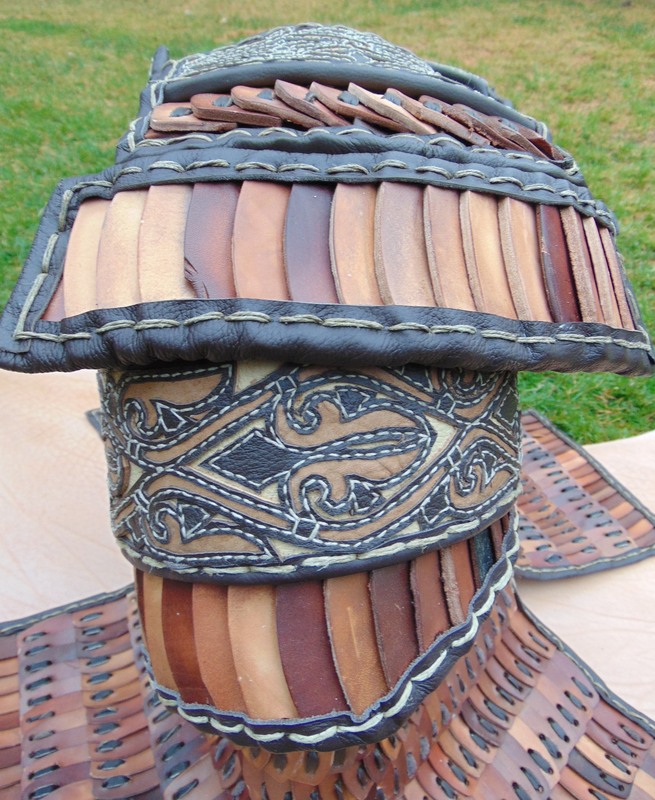 2.20 U-shaped lamellar leather armour 2. 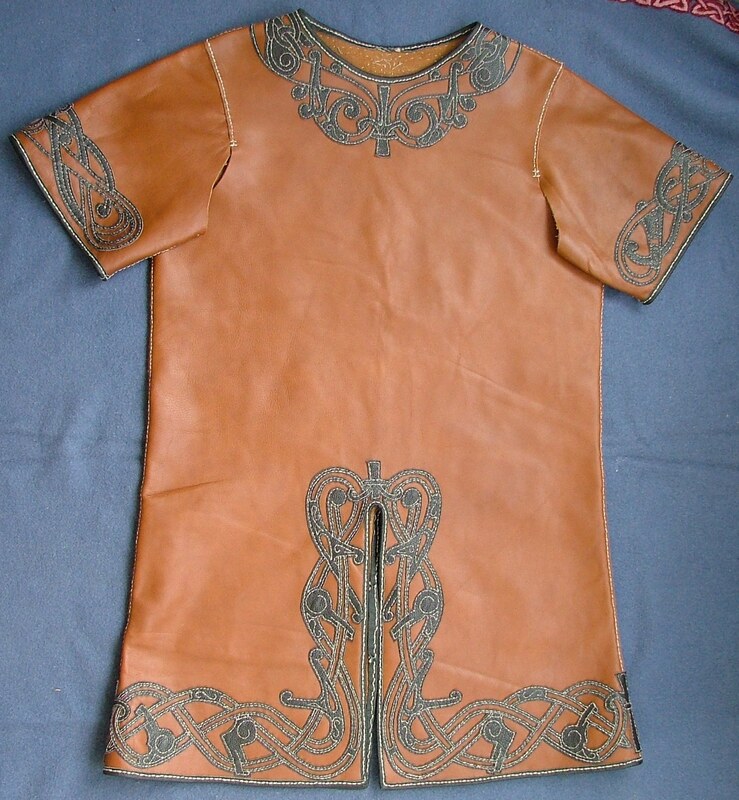 2.21 Leather caftan with appliques. 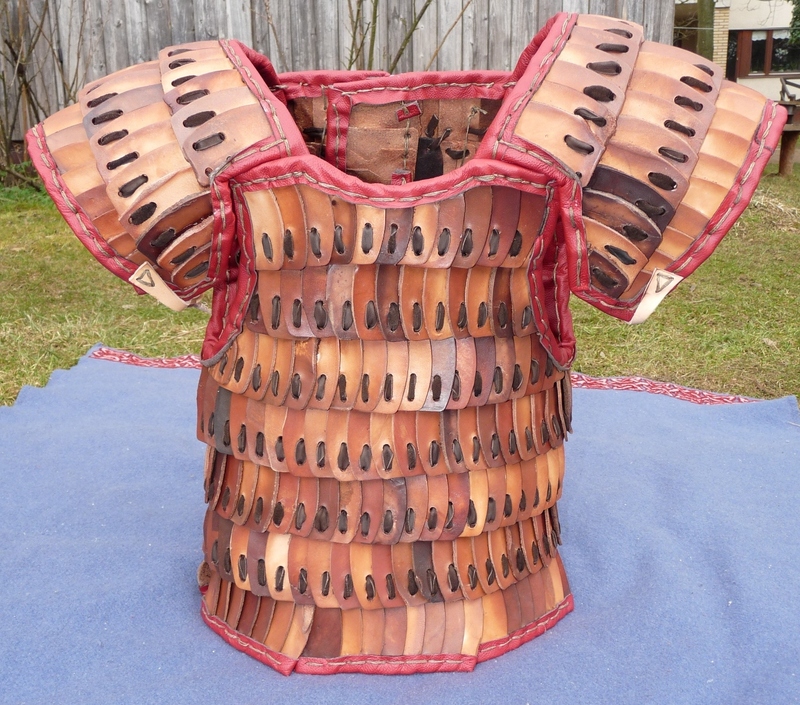 2.25 Medieval leather armour for a lady. 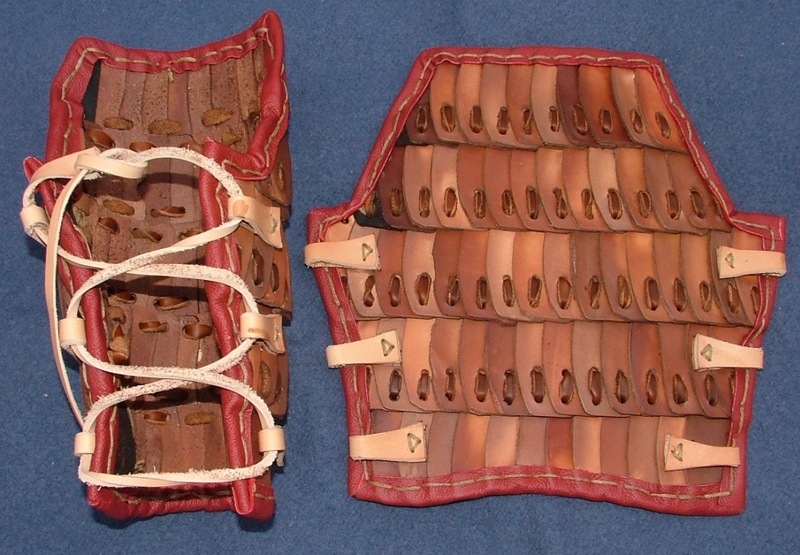 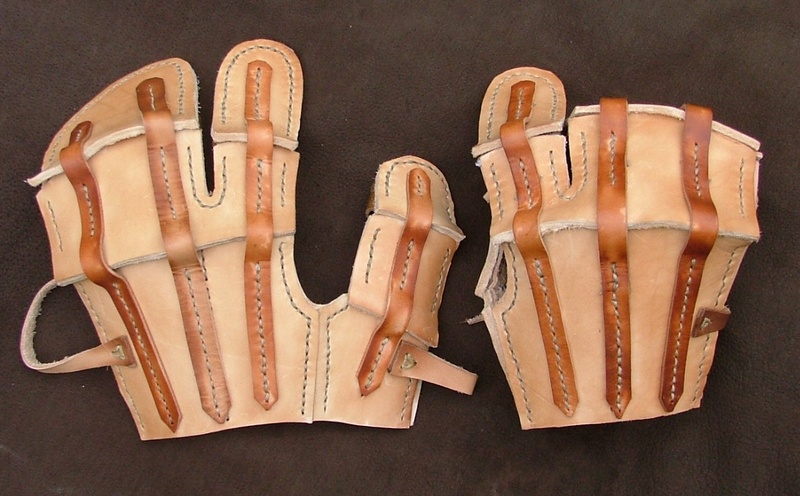 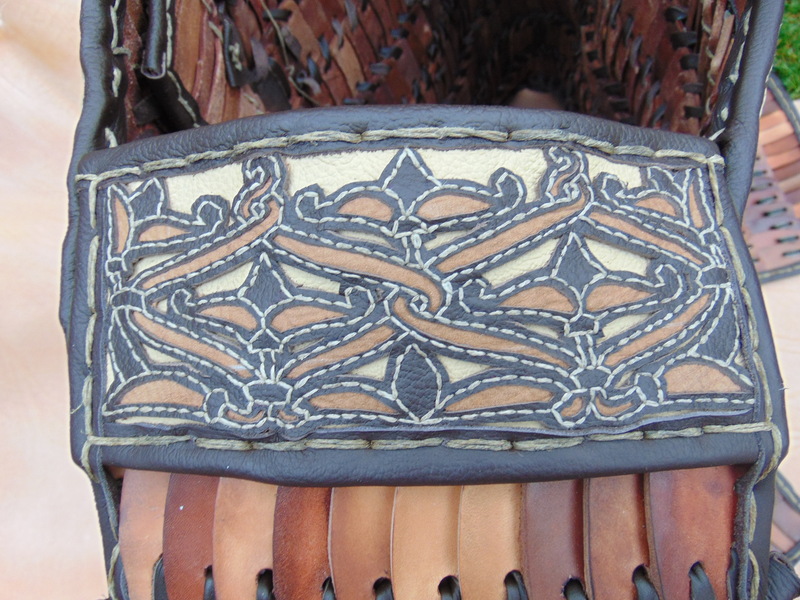 2.26 Leather lamellar for a lady 2. 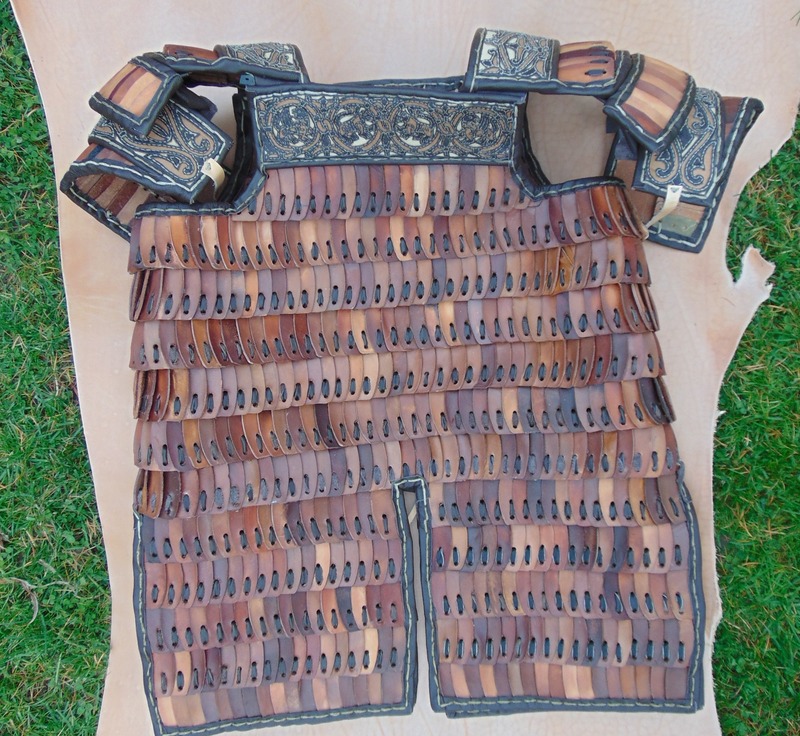 2.27 Armour with a longer waist protection. 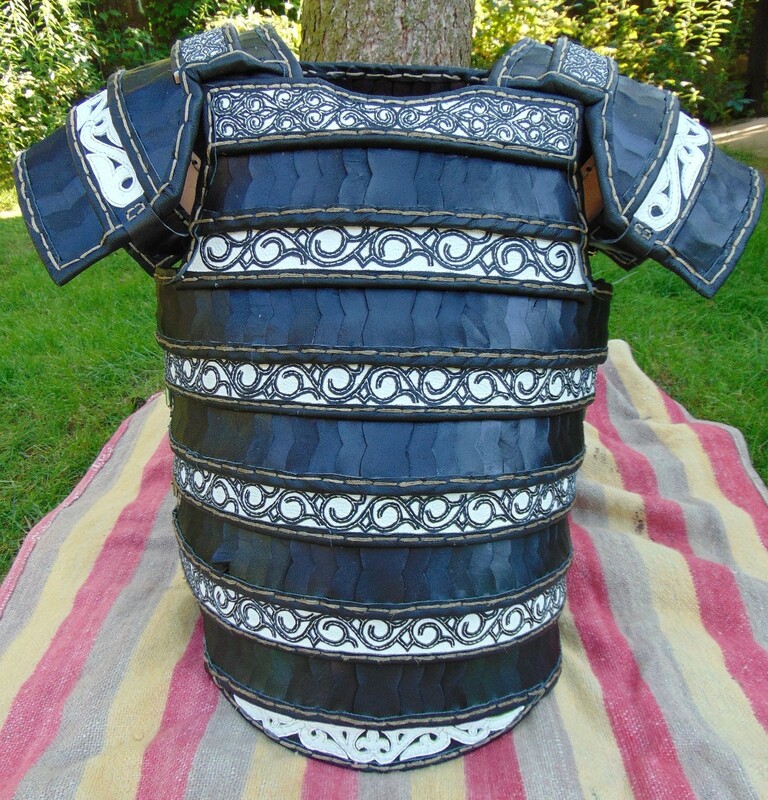 2.28 Lamellar armour painted black. 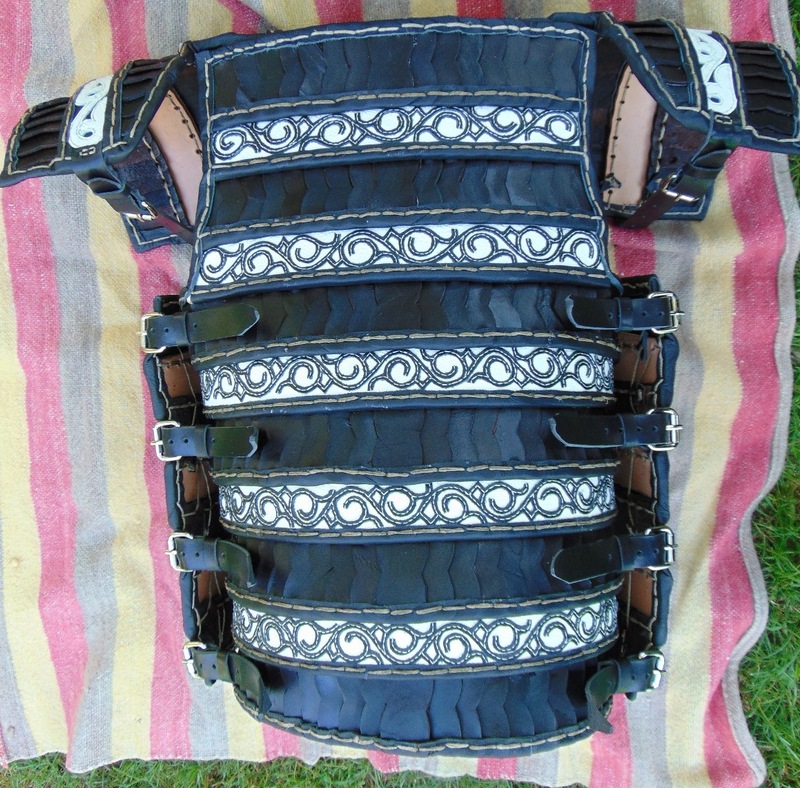 2.29 Spine protection which I use to assemble by every armour. 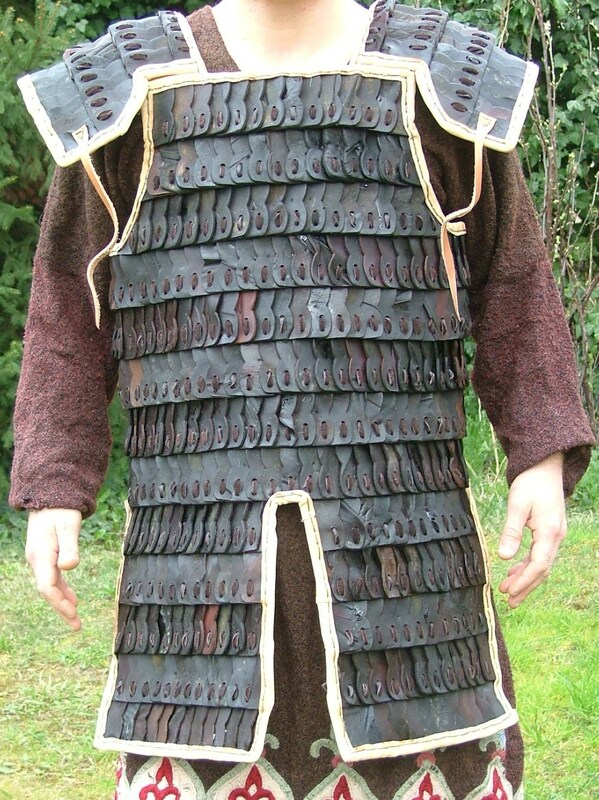 2.30 Leather armour of B-shaped plates. 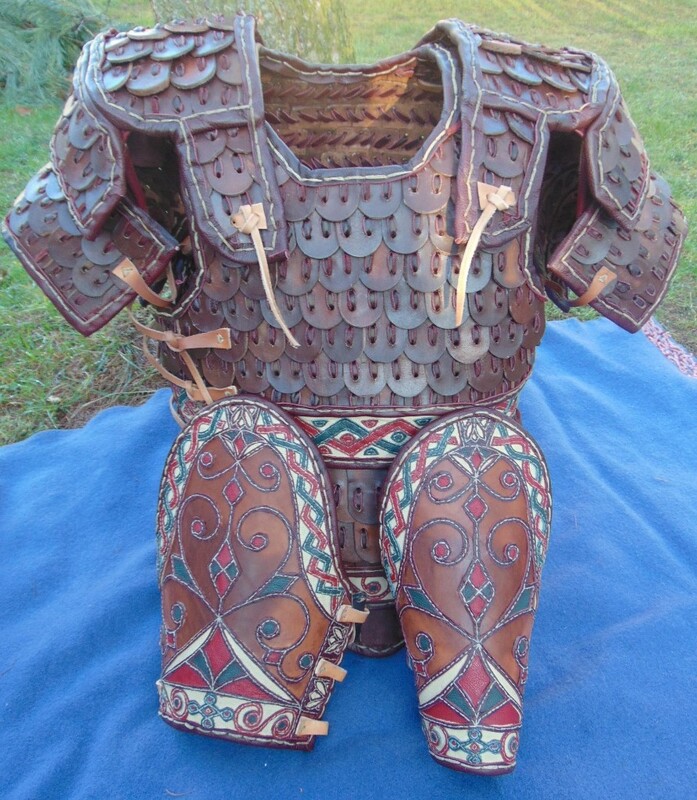 2.31 Armour with floral-style ornaments. 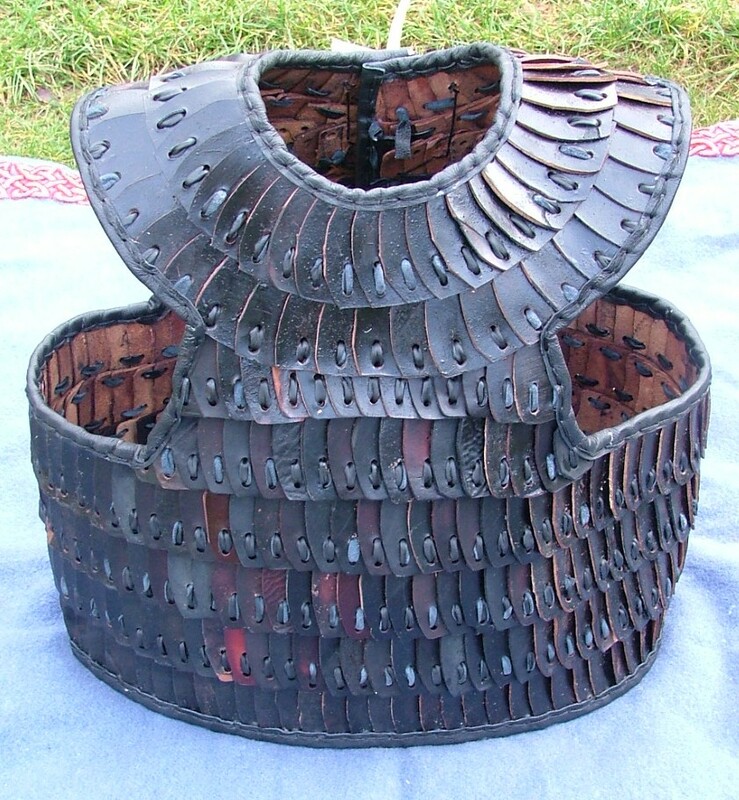 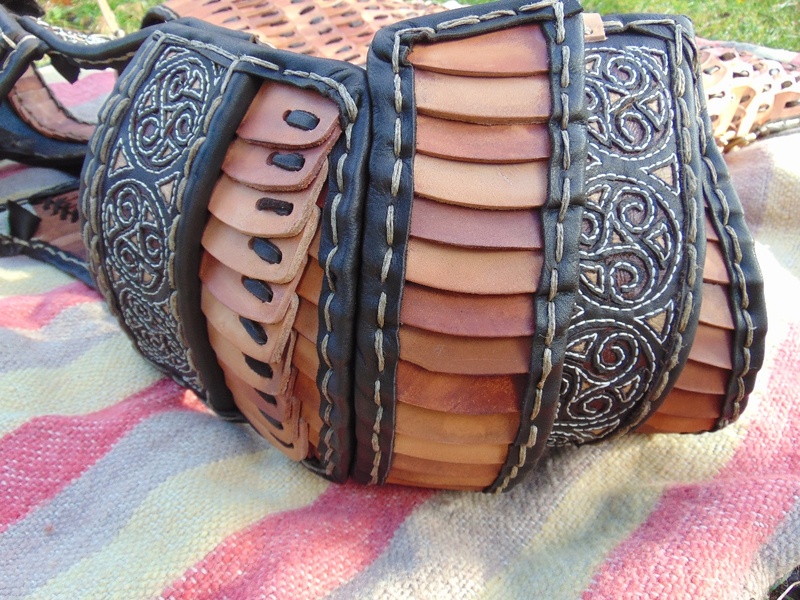 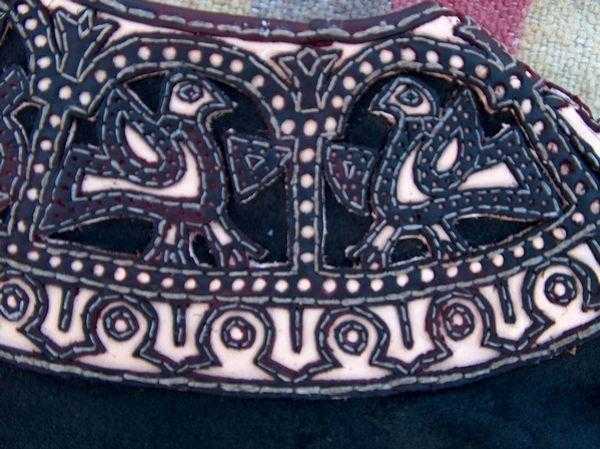 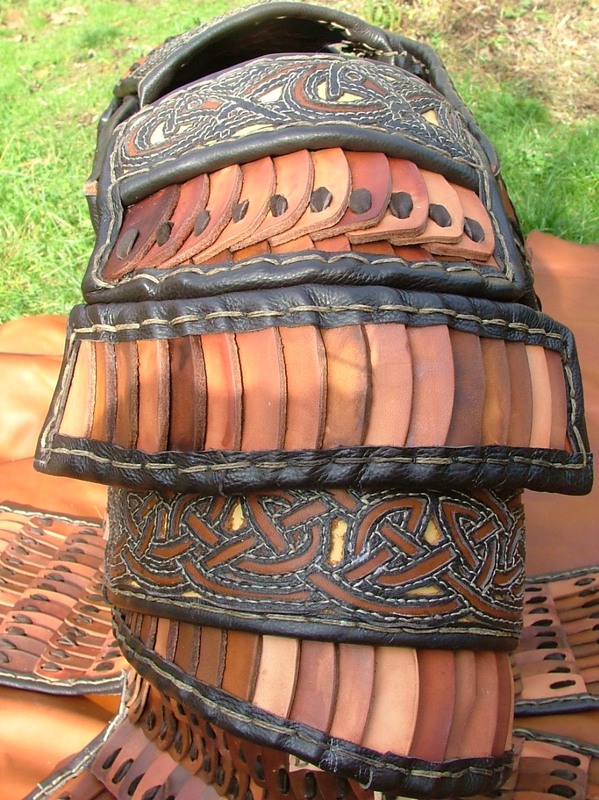 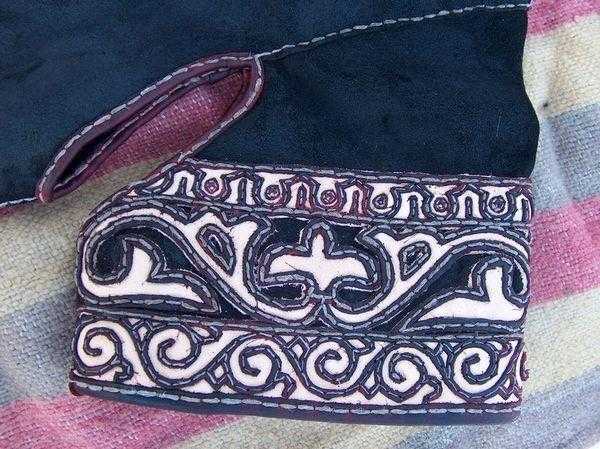 2.32 Medieval leather lamellar with gorget. 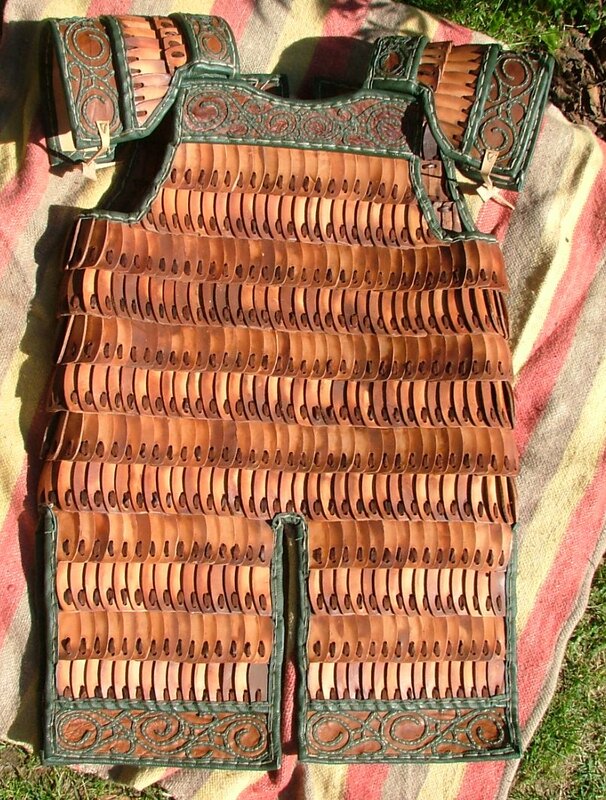 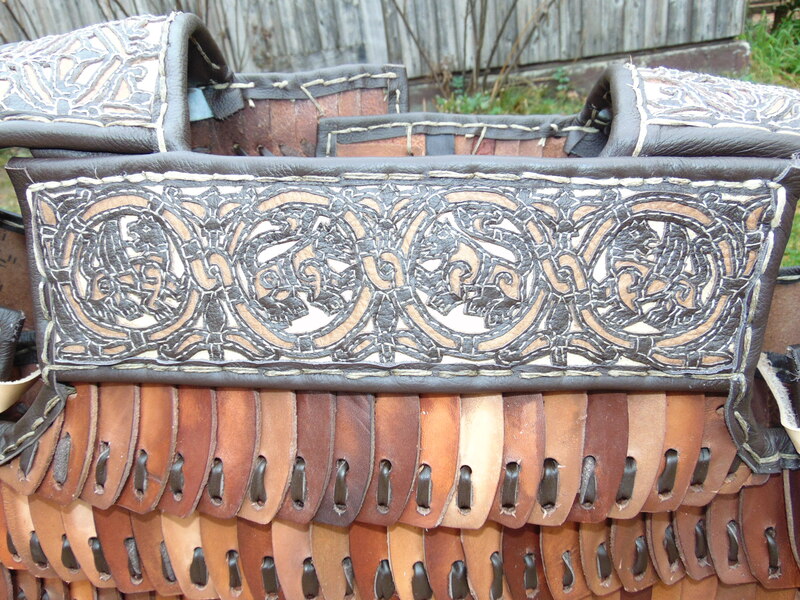 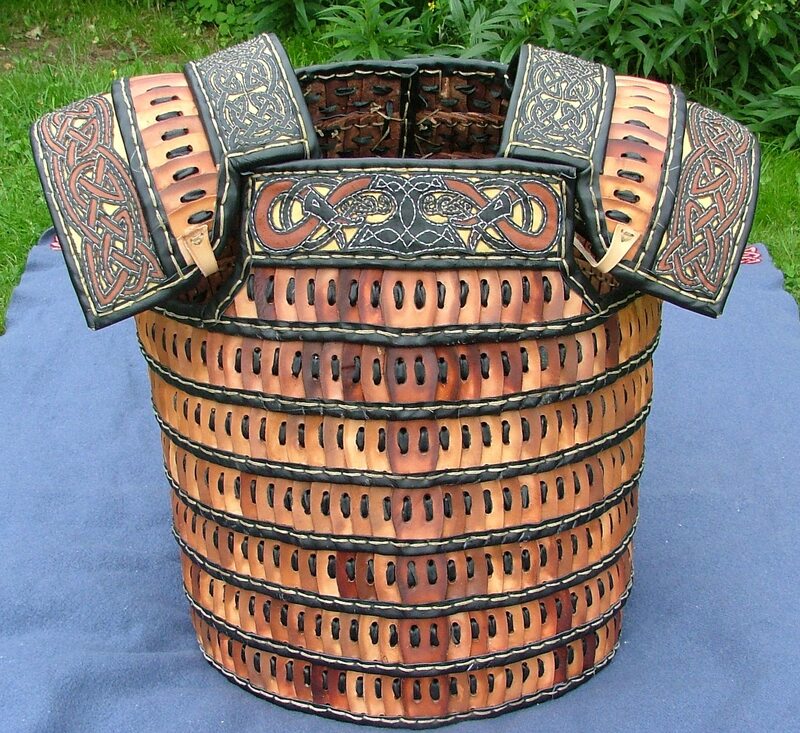 2.33 Mongol cuirass, good for horseback. 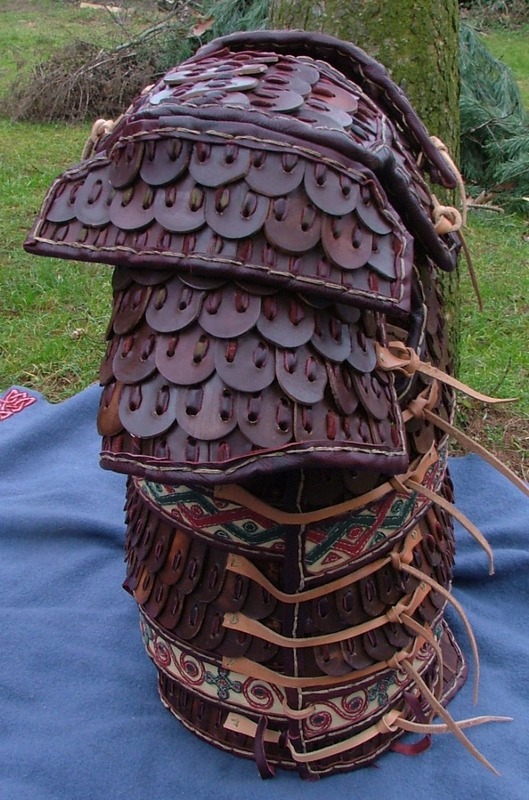 2.34 Lamellar armour with magyar-style ornaments. 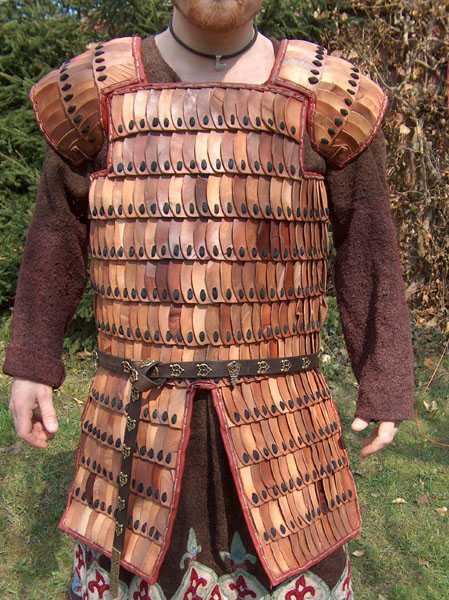 Magyar cuirass2. 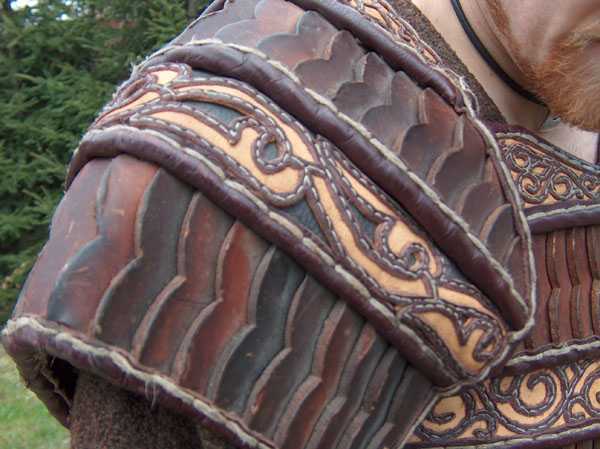 Magyar upperarm detail. 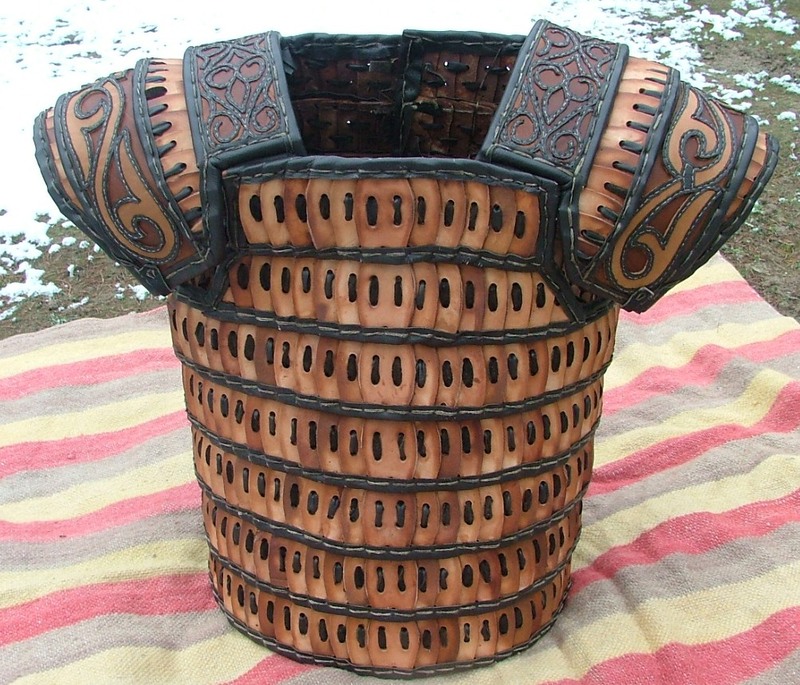 2.35 Cuirass made after an relief from the ancient Palmyres. 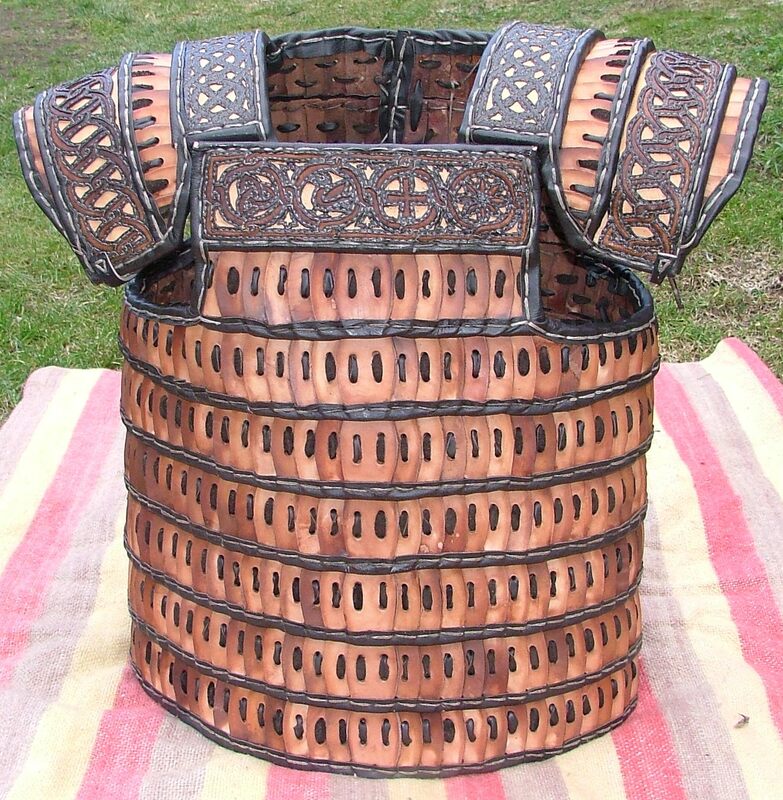 Palmyres1 The back of the armour with the detached shoulder protections. 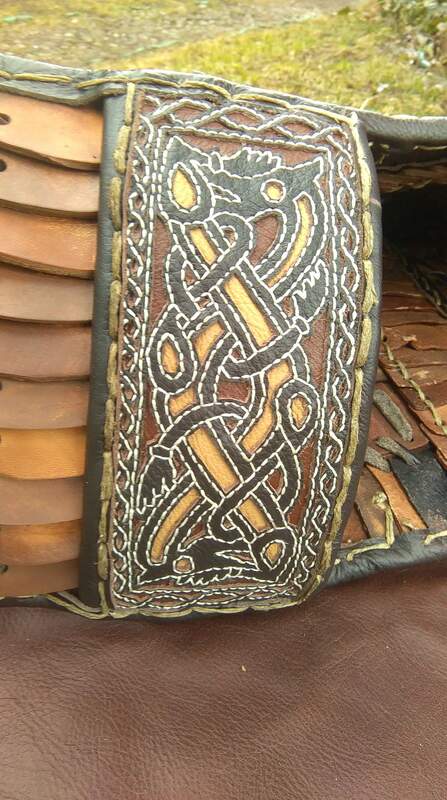 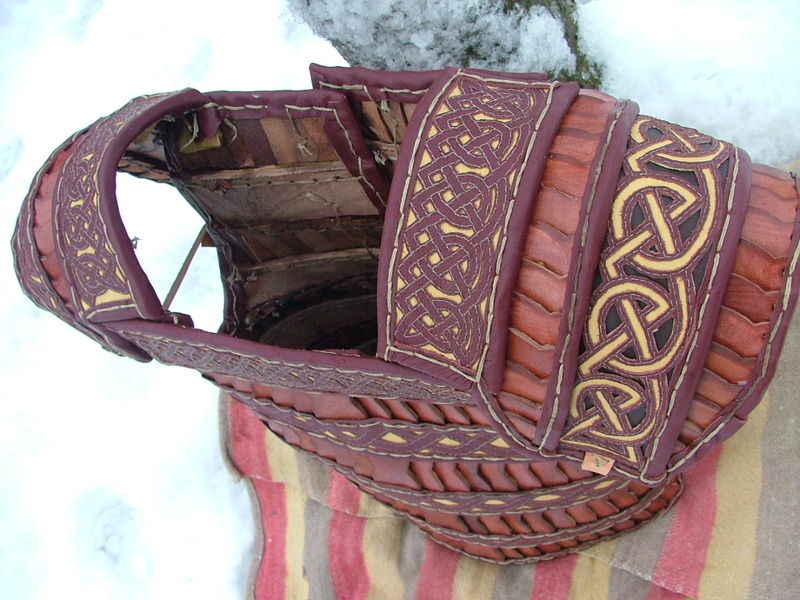 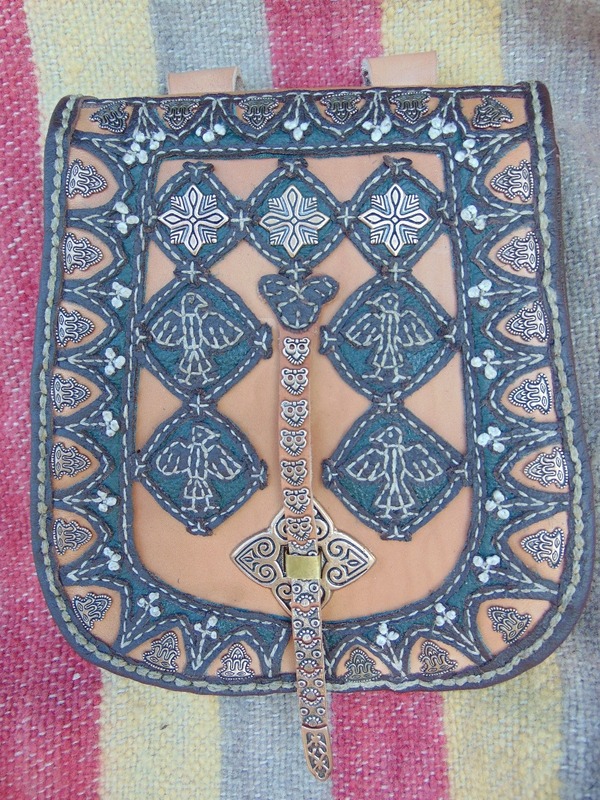 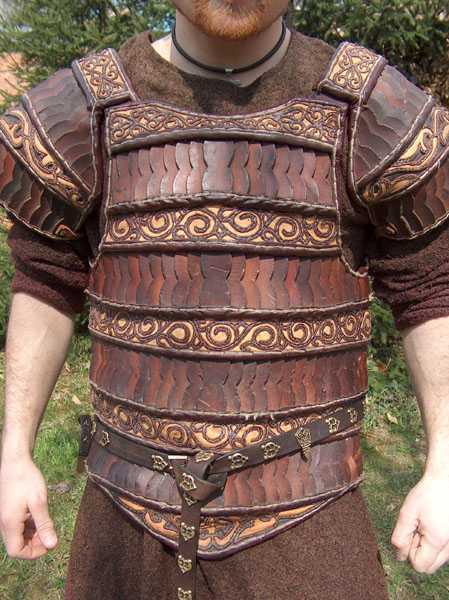 2.36 Leather armour decorated after Sir Tolkien's Numenorean designs. 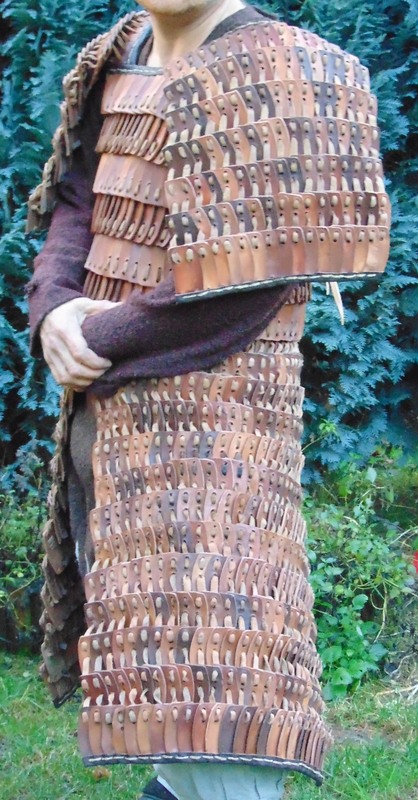 Numenorean cuirass and vembraces. 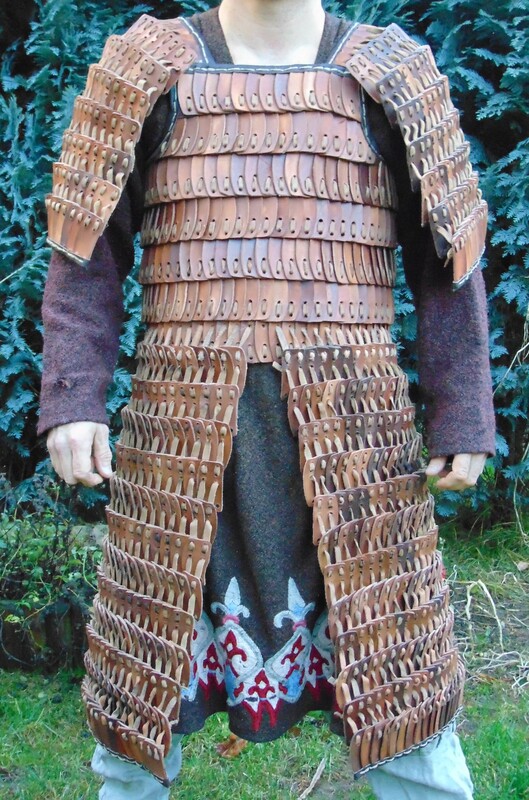 Numenorean armour and vembraces. 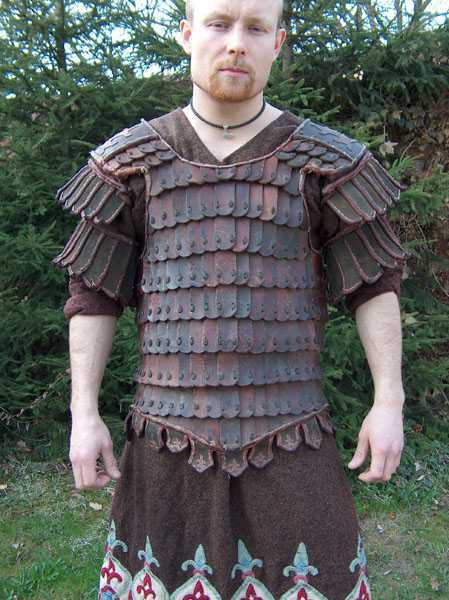 Numenorean vembraces. 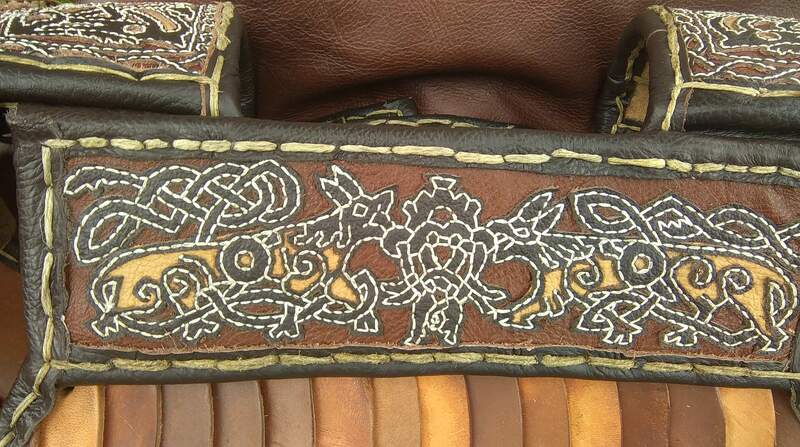 Vembraces decorated after Sir Tolkien's Numenorean sketches. 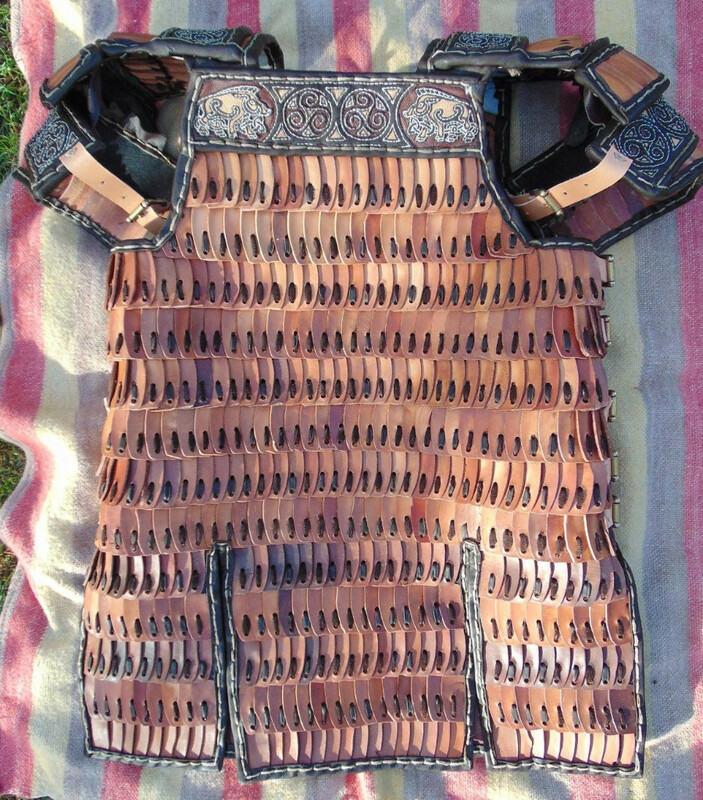 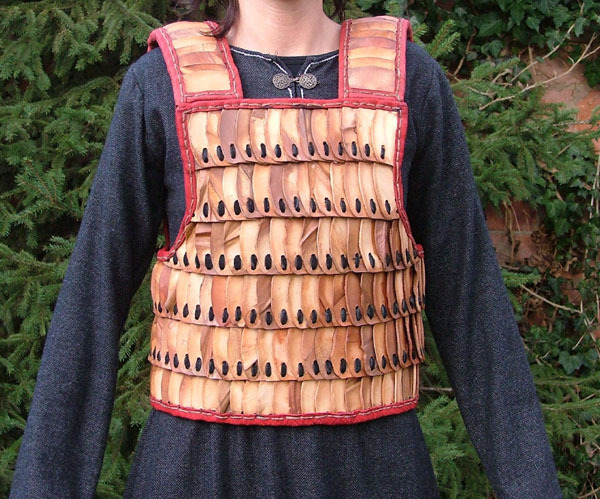 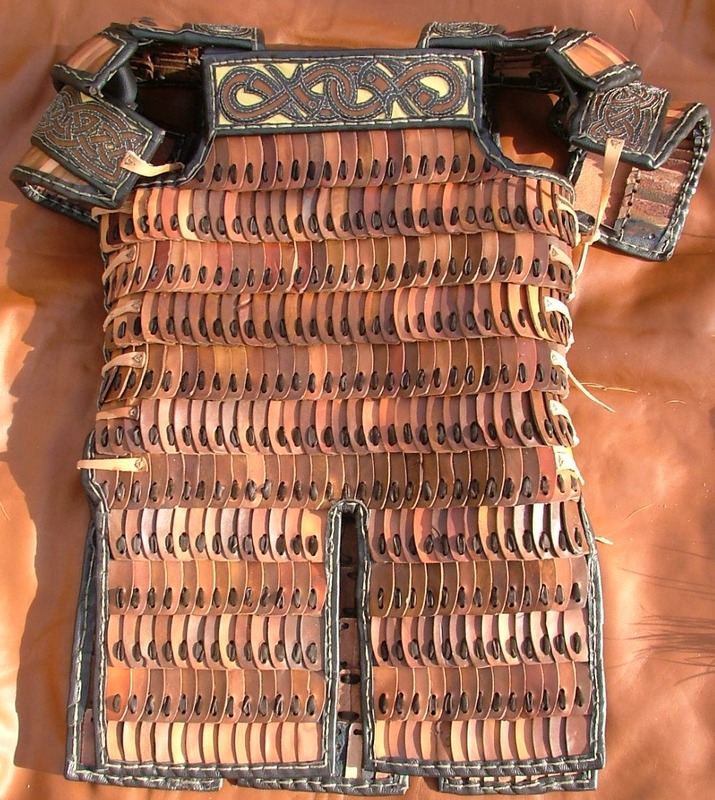 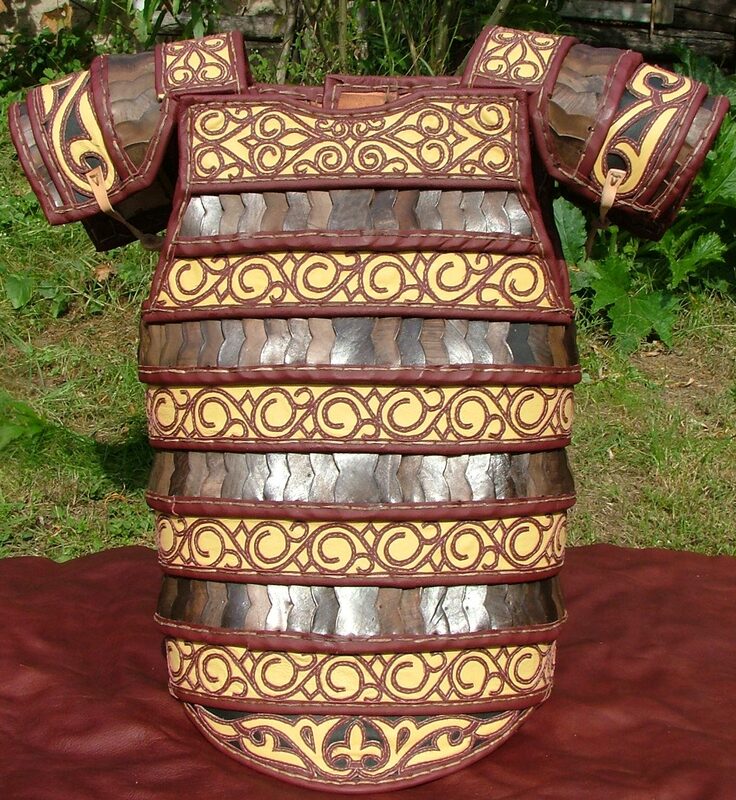 2.37 Lamellar armour with Celtic boars and Triskels. 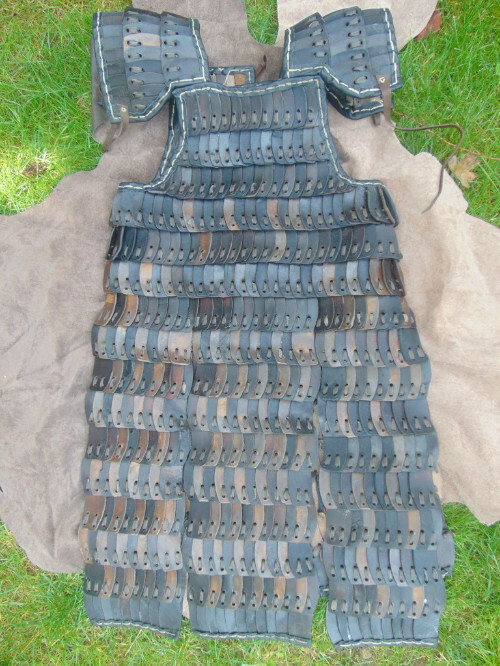 2.38 Lamellar armour with white and black apliques.